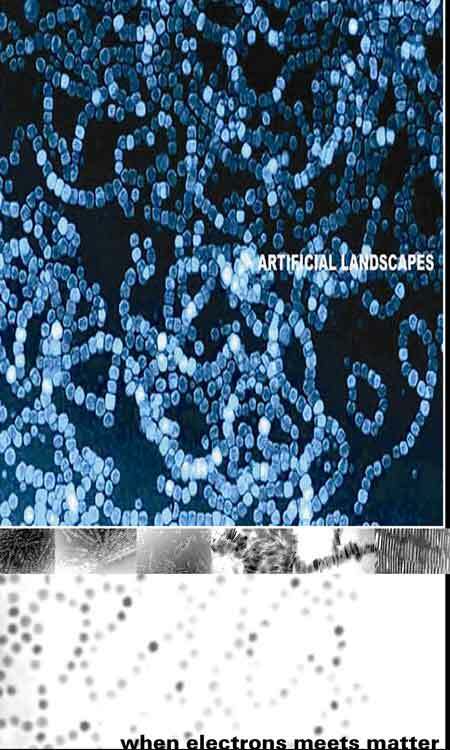 'Artificial landscapes' is a collection of panoramic views through the eye of an electron microscope made by Victor F. Puntes. The views presents an aerial tour to the nanoland, looking deep inside matter instead of looking at the sky. The tamed magnetic deflection of a scattered electron beam in reasonable vacuum after impacting a distribution of metallic and organic materials is projected, leaving an imprint somehow witness of the atomic-scale electron density of the encountered matter. The evaporation of the solvent in a colloidal solution traps the system in a state remain of its dynamic behavior, such that at laboratory temperature, van der Waals, dipolar, capillary and other forces are of similar magnitude, which together with entropy lead to a marvelous broad variety of self-assembled shapes … unless it is our ability of seeing different what is the same. What appears, evokes, is amazingly and warmly familiar, and is probably the result of a sequence and distribution of accidents that are similar at different length scales. The building blocks which conforms the self assembled shapes consist on individual crystals of about a dozen of nanometers, which means roughly 20 to 30 cobalt atoms side to side.